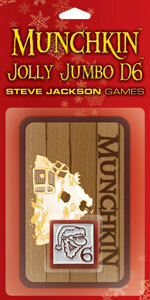 It's a Christmas 25mm die with classic John Kovalic Munchkin art... AND four new Munchkin cards - two Doors and two Treasures! What are you waiting for? If you like this one, be sure to pick up the green Jolly Jumbo d6, too... it has four Different new cards for your Munchkin game!